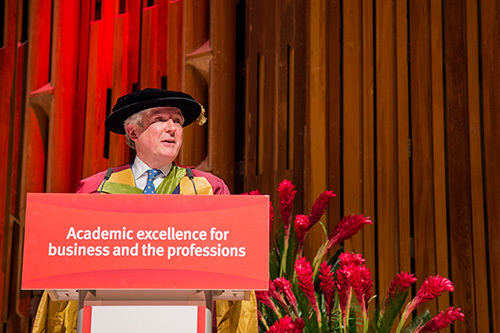 The Director-General of the BBC, Tony Hall, has received an honorary degree from City, University of London. He was made a Doctor of Arts in recognition of his outstanding contribution to the profession of journalism, at a ceremony on Monday 29th January 2018. Tony Hall, Lord Hall of Birkenhead was presented with his degree by the Chair of Council at City, Mr Rob Woodward, at the Barbican Centre in London. The award was conferred during a graduation ceremony for students from the university's Department of Journalism. Speaking during the event, he said: "I would remind all of you who are setting out in journalism that, in the false information era, it has never been more important to make sure everyone has access to news they can believe in, and analysis they can trust." Lord Hall has been in the arts and broadcasting for more than 40 years, starting as a trainee at the BBC in 1973 and holding a number of senior roles including Chief Executive of BBC News. He left the BBC in 2001 to become Chief Executive of the Royal Opera House but returned to the corporation in 2013 to begin his current role. Among his achievements at the BBC are the launches of several successful platforms, including the BBC News website, BBC Radio 5 live and the BBC News channel. The Department of Journalism at City elected Lord Hall as an Honorary Visiting Fellow in 2012.